Vancouver, BC - Skyharbour Resources Ltd. (TSX-V: SYH) (OTC Grey: SYHBF) (Frankfurt: SC1N) (“Skyharbour”) is pleased to provide an update on its inaugural diamond drilling program on its flagship Preston Uranium Property (the “Property”) in the southwest Athabasca Basin. The Western Athabasca Syndicate (the “Syndicate”) has drilled seven holes thus far for a total of 1,571 meters with two to four additional holes planned in May. The most recently completed hole, PN14007, intersected twelve zones of radioactivity, including the highest levels recorded to date at the Preston Property as defined by a downhole gamma probe including a 0.75 meter zone measuring 1,432 counts per second (cps) in a background of 80 to 100 cps. The initial seven drill holes tested the Swoosh target, a six-kilometre long corridor consisting of geophysically anomalous areas as defined by gravity, magnetic and EM surveys, coincident with surficial geochemical anomalies. Six holes were completed to depths of between 200 and 360 meters downhole, while one hole was abandoned due to poor drilling conditions. Overburden depth varies from 4 to 38 meters and immediately overlies basement rock. All seven of the holes intersected a broad, hydrothermally altered and reactivated, structural zone. Five of the holes returned elevated radioactivity and intersected multiple graphitic units within sheared and altered basement lithologies. The alteration commonly consists of pervasive chlorite, hematite and clay development; features which are common to uranium mineralization in the Athabasca Basin. Drilling is currently recommencing after the breakup period to test the CHA and Fin targets. A review of final assays and geochemistry will be carried out upon receipt of results expected in early-June. All holes were angled holes, drilled at -45 to -50 degrees. They were radiometrically surveyed using a RS-230 gamma-ray spectrometer, and a Mount Sopris 2PGA-1000 downhole natural gamma probe. Natural gamma radiation in drill core reported in this news release was measured in counts per second (cps). All intersections are downhole and core interval measurements and true thicknesses are yet to be determined. The reader is cautioned that a total counts gamma probe reading is the result of natural gamma radiation that may come from various sources including cosmic radiation, thorium, potassium and uranium and its radioactive decay products. CPS values cannot be certain to correlate with uranium grades of the rock but are a general guide of the radioactivity of minerals present in rock placed in proximity to the instrument. The Syndicate’s Technical Team considers these findings in the early stages of the first drill program to be a significant breakthrough towards locating shallow uranium mineralization, and decided to expand the initial drill plan at the Swoosh target as a result. Additional field work and drilling is being planned at the Swoosh target for later in the year. The three initial target areas, out of a growing target base currently standing at fifteen, were selected by the Syndicate’s Technical Committee for drilling based on encouraging fieldwork results and coincident anomalies from ground gravity, airborne and ground EM and magnetic (graphitic conductors and structures), radon, soil, biogeochem, lake sediment, prospecting and geological mapping surveys. 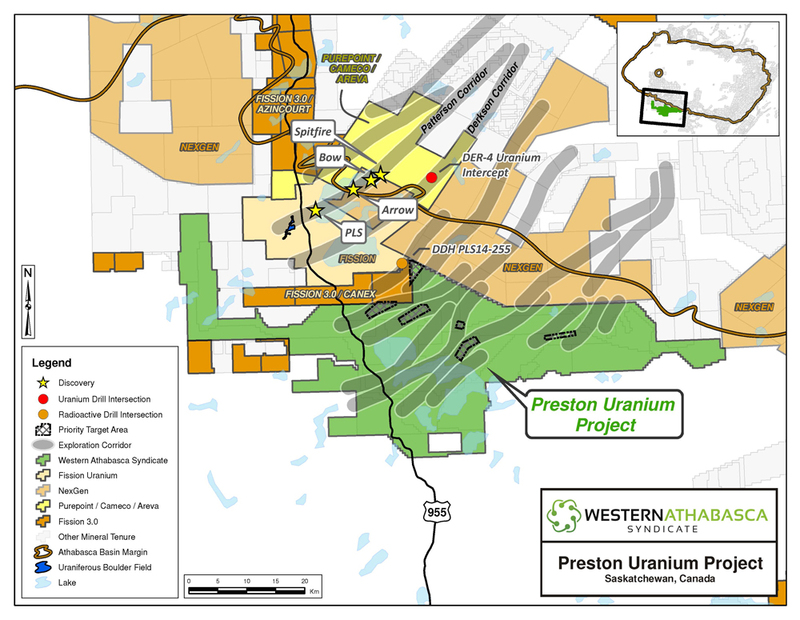 This drill campaign represents the first modern-day drill exploration program on the Preston Uranium Property with follow up programs planned for later this year given the encouraging results to date. Approx. $3,500,000 dollars in exploration has been carried out to date by the Syndicate on the Preston property and many priority targets remain for further follow up with both fieldwork and drill testing. The Syndicate continues to employ a systematic, proven exploration methodology that has led to numerous uranium discoveries in the region and throughout the Athabasca Basin. 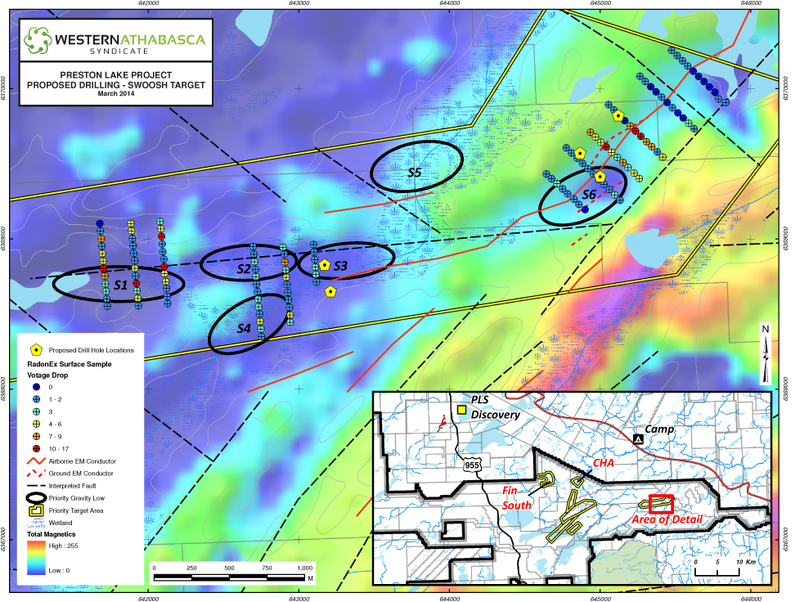 This has been very effective in identifying numerous high-quality targets at Preston with similar geological features and exploratory indicators as those at the nearby PLS and NexGen discoveries as well as other deposits in the Athabasca Basin.